So my sister. She is anything but traditional. So I’m not sure why it surprises me that I have somehow ended up making the guest book for her wedding. She didn’t want the traditional guest book. I used flat 12×12 canvases for the front and back cover. Painted them then used Making Memories foam alphabet stamps to stamp the names and date. I designed the inside pages in photoshop. 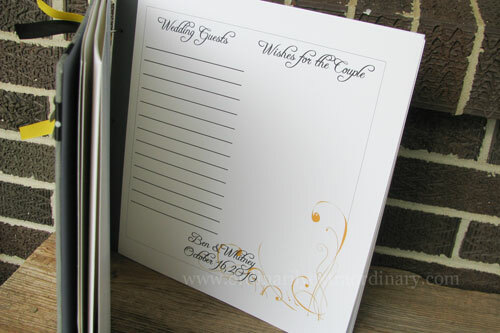 There are also pages inside for her showers and parties with a place for the guest to sign and for the gift they give. I worry that it’s a bit on the big side for this, but the 8×10 size was just too small. Very pretty! Wish I’d have thought to do something like this for my wedding, oh, 7 years ago. 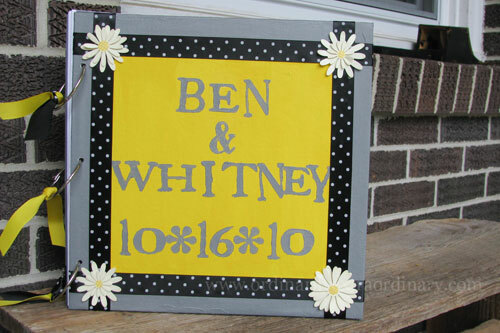 My color was yellow, and my flowers were also daisies. I love this. Wish I’d done something like this than what I did do. You are making a wonderful memory for your sister, great job! This is fantastic!! Did you do the pages digitally, then print them? ?